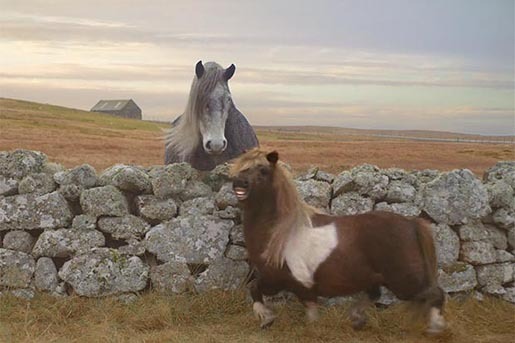 British teleco Three is running an integrated advertising campaign centred on a moonwalking Shetland pony called Socks. A television commercial introduces the public to a horse that dances to impress the other ponies, along with the slogan, “Silly stuff. It matters”. In the spirit of sharing on social media, fans can create their own version of the ad on a web-based app hosted on YouTube, ponymixer.com. “Never underestimate the power of a plucky little pony. Make someone’s day with your own pony mashup. The Pony campaign was developed at Wieden + Kennedy London by creative directors Dan Norris and Ray Shaugnessy, creatives Freddie Powell and Hollie Walker, and agency producer Michelle Brough. Editor was Tom Lindsay at Trim Editing. Visual effects and telecine were produced at Moving Picture Company, London, by VFX producers Josh King and Sam Davidson, VFX coordinator Steph Karim, creative director Jake Mengers, VFX supervisor Tom Harding, VFX team Yosuke Matsuno, Graeme Eglin, Oliver Caiden, Vivekananthan R, Grant White, Alex Cernogorods, S. Sundaramoorthy, Sugarmar S, Sivakumar R, Venkatesh R, S. Rajesh, Arun Kumar, Silambarasan R P, Rajinikanth R, Rajkumar C, Ragesh Ramchandran, Vishal Kaushal, Jacob Oomen, Pinto Sasikumar, Dheeraj Hebbar, Adam Leary, CG lead Carsten Keller, CG team Fabian Frank, Christopher Antoniou, Grahame Curtis, Tom Rowell, Alberto Della Regina, Robert Hemmings, Tim Van Hussen, El Suliman, Dominic Edwards, Ted Lister, Michele Svaeren, and colorist Jean-Clement Soret. Sound was produced at Wave Studios. Music is “Everywhere” by Fleetwood Mac.